Colin is married to Rachel Wright, and is a co-founder of Solipsys Limited along with Andrew Lipson. 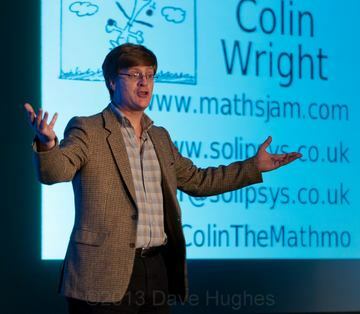 Colin plays the Game Of Go (badly), piano (worse) and can juggle and unicycle in addition to having a Ph.D. from Cambridge in Combinatorics and Graph Theory, which are areas of mathematics. Colin's Ph.D. supervisor was Bela Bollobas. Oddly enough, even though Béla has an Erdos Number of 1, and Colin's Erdos Number is 2, Colin and Béla have never co-authored. The path from Colin to Erdös goes via Ron Graham. See the Paul Erdos page for more information about this amazing man. You can also see Colins Mathematical Ancestry. Colin was unreasonably delighted recently to realise that he has an Erdos Number of the second kind, and it's just 3. This goes via Graham Brightwell and Bela Bollobas. In his "copious free time ..."
Colin still runs Solipsys Limited, now with Neil Walker, and is the presenter of the popular science Juggling Talk series. He is a former President of the Liverpool Mathematical Society, about which he should write some more. I've started writing a sort of "web-log", or "Blog", over at Colins Blog. I'm not sure what I'll write, it's a bit of an experiment. It certainly won't be updated every day - I don't think I have that many insights worth sharing. Besides, I'm pretty busy trying to learn a bit of Spanish, some Lojban Language, doing talks, and trying to run two companies.